Just before Christmas I took the girl down to Soho early on a Saturday morning (as you do) in order to choose some material for Daddy’s christmas shirt. We were headed for the achingly minimalist, shabby chic Cloth House. So far, the staff have managed to stop me from moving in full time. On the way down, I was caught short. Now, where can one go to the loo early on a Saturday morning in Soho, when some of the people are only just finishing up and going to bed? I used a time honoured technique, perfected in a city where just about every establishment declares that its loos are “for customer use only.” I tucked the girl under my arm and dashed into the nearest open pub, full of bleary eyed people having a fried breakfast. 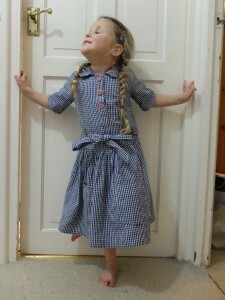 Oh, I’m so sorry, says I, but she (points at child) really needs the loo, can I use yours? The girl is quite short and can pass for 3 if she doesn’t say anything. Works every time. Nobody wants a toddler widdling themselves on their floor. The only caveat is that one has to brief the child in advance to avoid embarrassing contradictions. 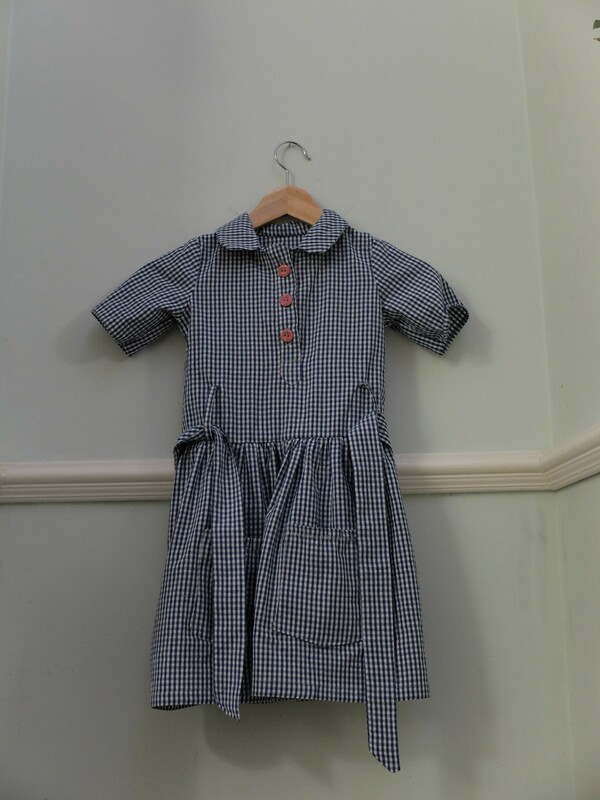 Once relieved, we went to Cloth House and as well as some Indian hand printed cotton for his shirt, we chose some bunny print for myself, and at her Majesty’s insistence, some organic blue gingham. 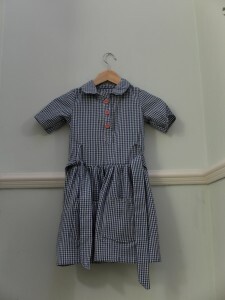 I’ve waxed lyrical before about blue gingham and my childhood wish for a checky dress. Given she’s got a dry wipe marker stain on the other one, and a penchant for storing revolting stuff in her pockets, it was worth making another. Infant schools don’t seem to give a stuff about wearing summer uniform in winter, and indeed I think she’s started a trend for other girls to wear their checky dresses too. 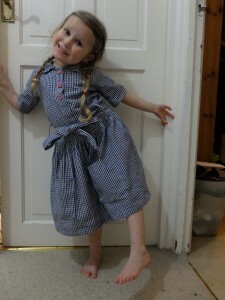 Other mothers have asked me where I got the original frock from and I reply *mumble made it mumble*. She wears a vest underneath (I am from Leeds), tights and a jumper or cardigan. The inside of her school is the approximate temperature of a sauna, so I was never concerned that she might be too cold in it. So Jump Rope Dress 2 beckoned. This time I used chalk to mark out the placket. Sensible, see? No markers that disappear under the iron this time, oh no. It’s still not perfect, but it looks fine from the outside. The pink buttons were Her Majesty’s choice and this time she opted for snowflakes on the pockets. Problem is, she moves whilst a coat hanger does not. The organic gingham is smoother than the other handloom stuff, and as you can see the checks are smaller. I fouled up the collar a bit as I used a 3/8″ seam allowance rather than a 1/2″ – surprising what a big difference that makes. I fixed it, more or less. She does wear shoes for school. This time I made sure I bought enough to have some left over for me.